J.C. French and Company, Inc. was established in 1976 to provide the Southern California area with a reliable, licensed, reasonably priced and quality conscious painting contractor. Our goals were to undertake and perform painting, abrasive blasting, waterproofing and wallcovering, according to the client's specifications. Our management team, as well as the owners, has actual painting and wallcovering experiences starting from apprentice, to foreman, to estimators and superintendents. This gives J.C. French and Company the knowledge and skills to provide better services for our customer's needs. In all, J.C. French executives have over 65 years of combined experience with the tools of the trades. Our ability to bid and undertake small to large projects lies within our diversification, productivity and teamwork with clients. J.C. French and Company executives have been past Presidents on the Board of Directors for the Tri-County Painting and Decorating Contractors Association. Belonging to the PDCA enables us to provide a broader knowledge of new laws and regulations along with safety and technical updates. 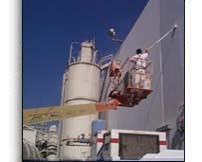 J.C. French and Company employs and maintains a work force of 80 to 100 painters year round. We are responsible for the safety and well being of our employees and dedicated to constant ongoing training. J.C. French maintains the highest level of insurances for all projects. Because of our dedication to ongoing safety training, our experience modification rate is the lowest among our competitors. Thus ensuring a very competitive bid price for our client's projects. J.C. French and Company have ongoing relationships with the regions premier general building contractors, property management firms, architectural firms and private owners. Our professionalism within the market place has made J.C. French and Company a respected and highly desired contractor within the southern California area.